The weather broke last week and it was cold as hell for a few days. As much as I dread the COLD weather, I do love cooking in it. I decided to take advantage of those cold days by whipping up a sort of baked sausage and potato dinner. It was awesome and I am so excited to share it with you. As a bonus, I’m going to share a few remixes of the recipe–you all know I can never just stick with the basic recipe. Salt eggplant and let sit while prepping the rest of the vegetables. Then, blot firmly with paper towels; it should take a couple of towels to “dry out” the eggplant. Cube eggplant. Toss all ingredients together and bake, covered, in a 400 F oven until potatoes are tender, about 40 minutes. 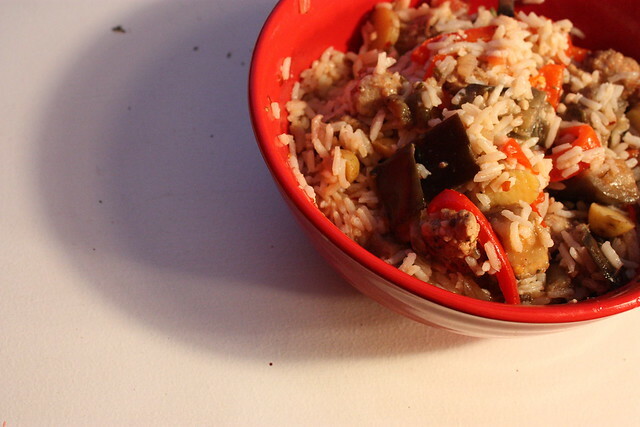 I really enjoyed this recipe and have been eating the leftovers since I cooked it up last week. I frequently prepare large batches of food then find creative ways to enjoy the leftovers so that I’m not eating the same exact thing over and over again. So, while you can eat this right out of the oven, you can also do a few things to mix it up! 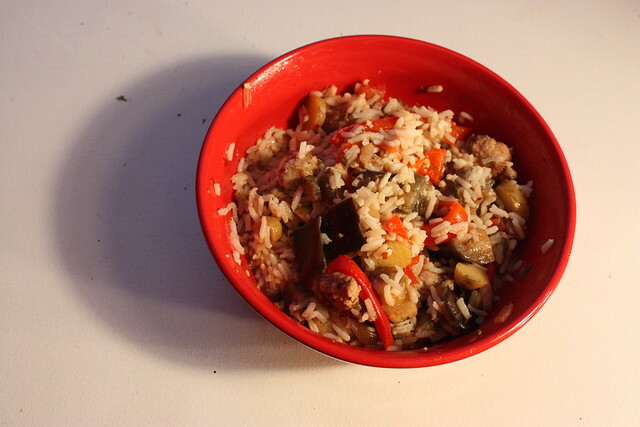 The images I included are from a night when I mixed it with rice (YUM). I took it to work and mixed it with pasta for another variation. I also think it would be AWESOME on a french roll as a sort of sandwich. This recipe is so full of flavor. It really just makes you feel all cozy and wonderful. That, my friends, is a very good thing. This sounds like a gorgeous recipe for a cold day, heading back to uni next week so will definitely be giving this one a go! Thanks!